NBE, Banque Misr and Banque de Caire issued dollar and euro certificates for Egyptian expats to support Egypt's economy. 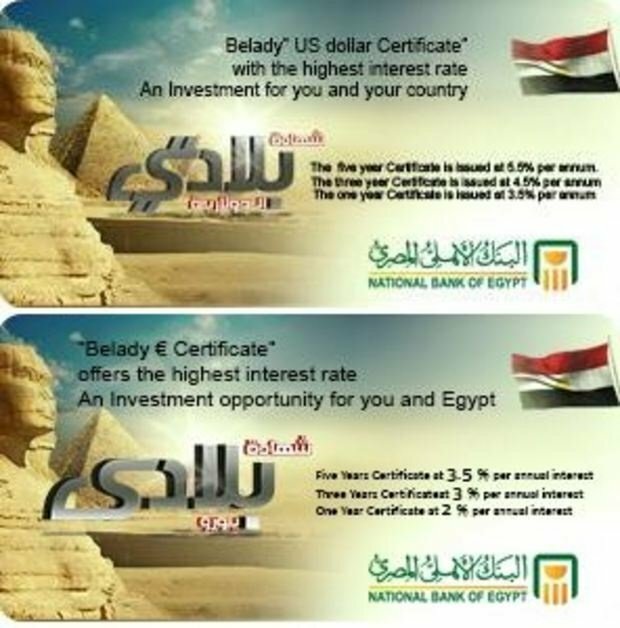 The National Bank of Egypt, Banque Misr and Banque du Caire launched Bilady US dollar and Euro certificates early in March. 1- It's a nominal certificate issued in the name of person or their minors. 2- It has 3 different maturity periods and interest rates: One year certificate with 3.5% interest rate per annum, three-years with 5.5% per annum and five years with 5.5% interest per annum. 3- The interest rate is fixed through the life of the certificate. The count starts one business day after purchase date and the interest is paid in US dollars or in Euros every 6 months. 4- The CBE guarantees transfer of redeemed value of the certificate with the interests outside Egypt without a maximum limit. 5- The one year is redeemable after 6 months from purchase, the 5 years is redeemable after 1 year and the 1 year certificate can only be redeemed after its full maturity. 6- The branches of the 3 banks offshore receive applications from interested buyers who can deposit $100 or its multiples without maximum. 7- The main aim of the certificate is to offer a channel for Egyptian expats to support Egypt's economy which has been suffering from shortage of foreign currencies. Minister of Immigration Nabila Makram traveled to Denmark last week to promote the certificates.